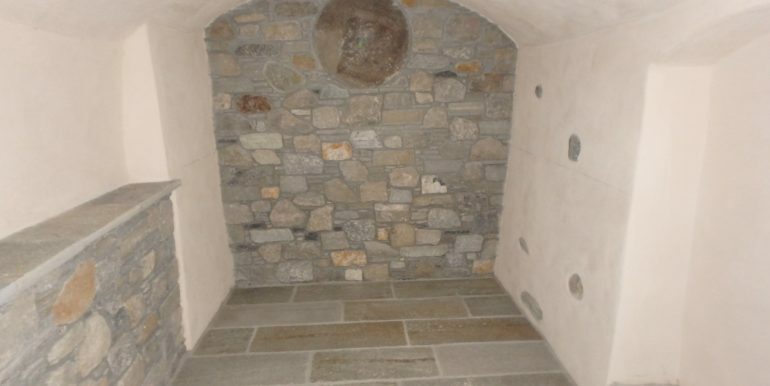 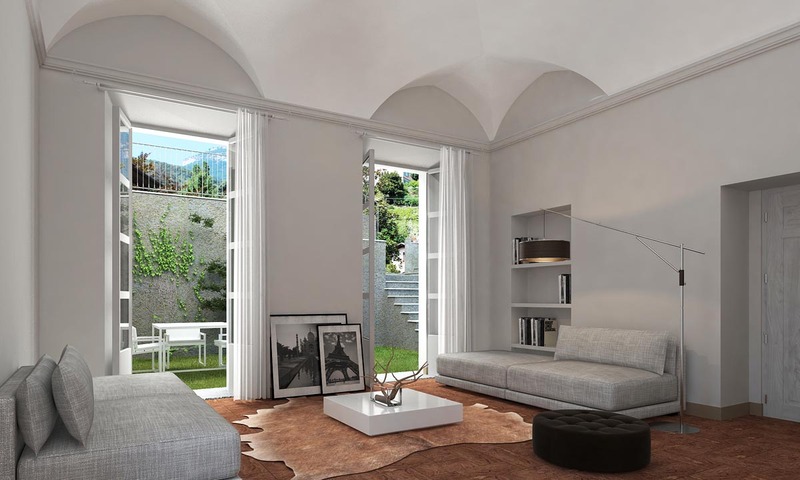 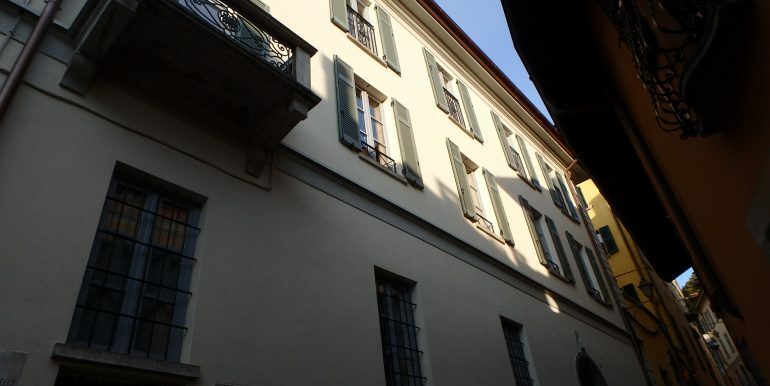 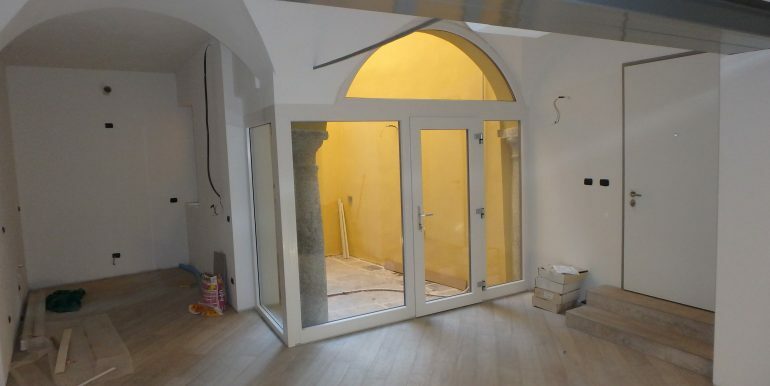 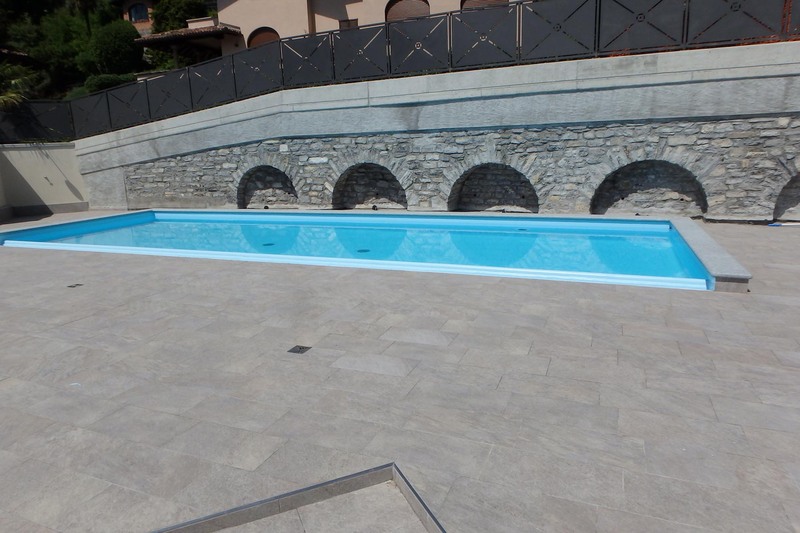 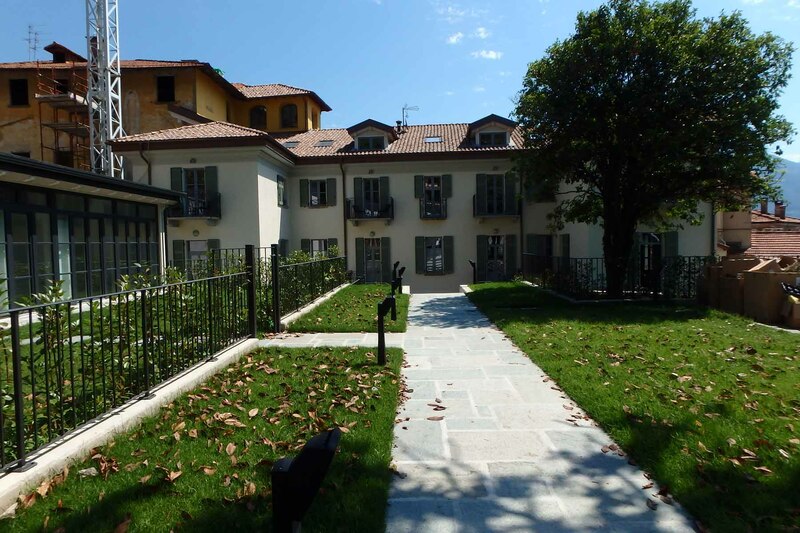 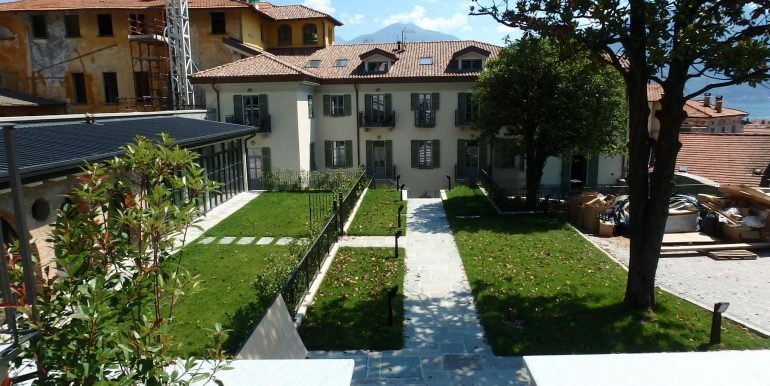 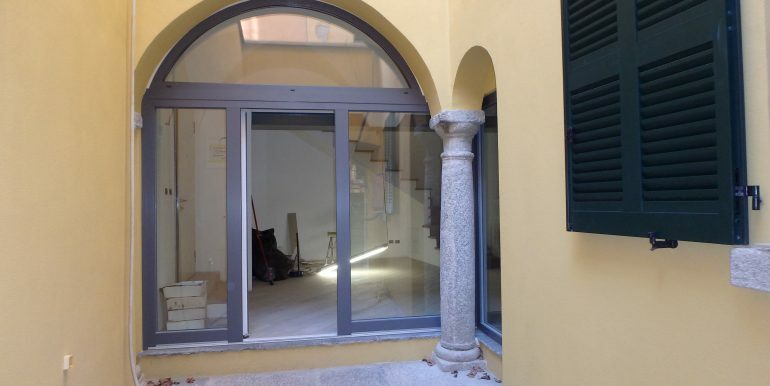 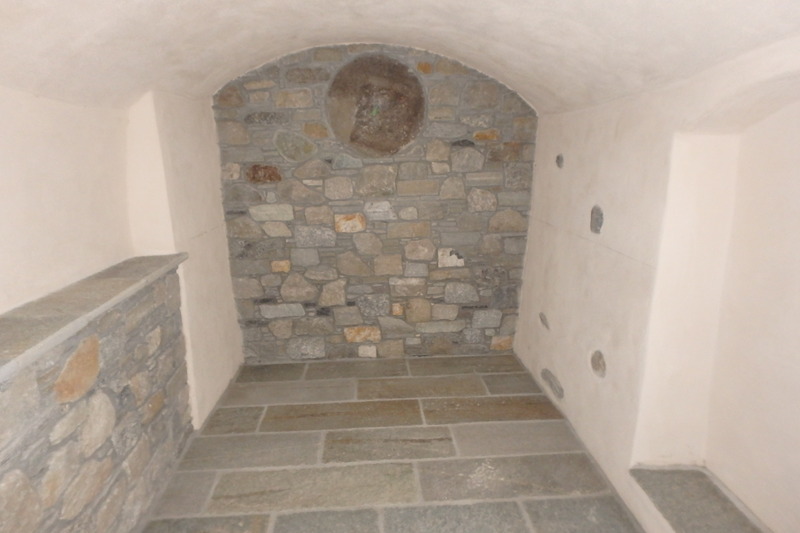 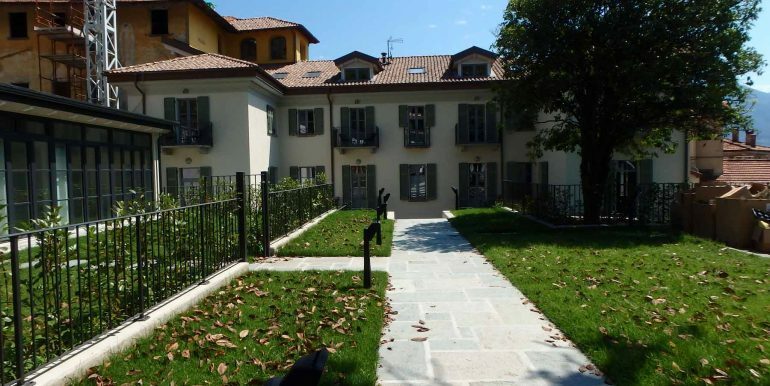 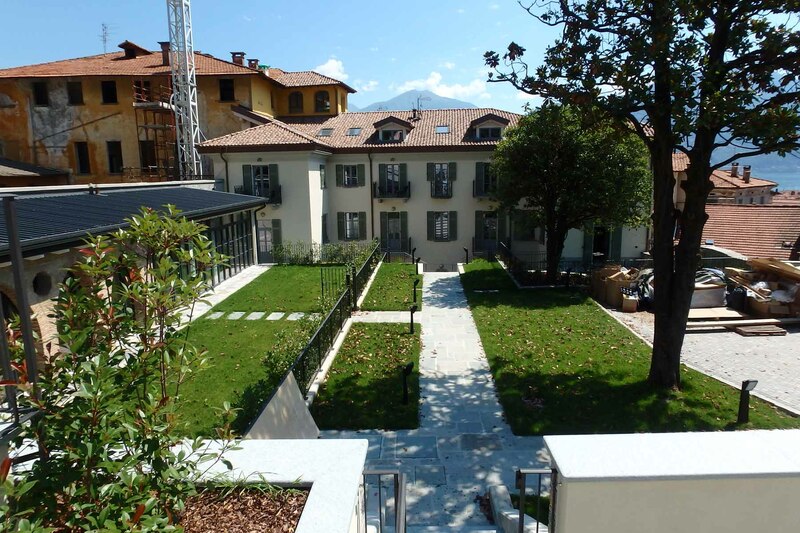 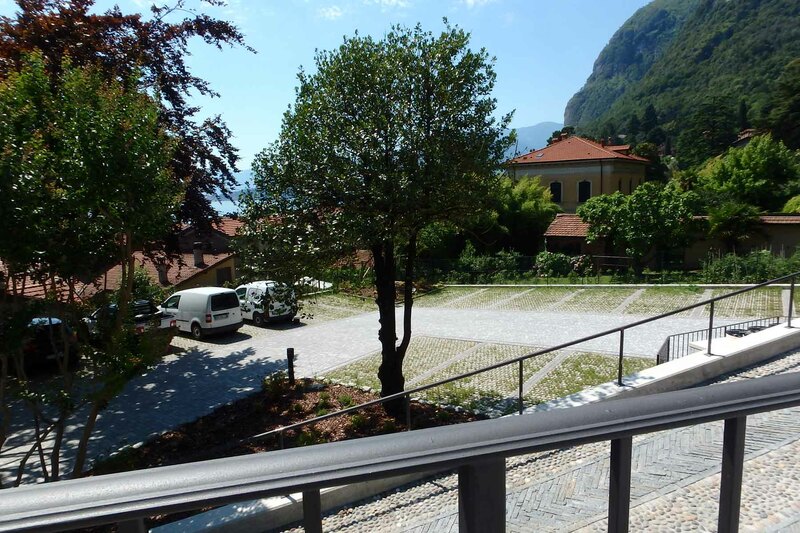 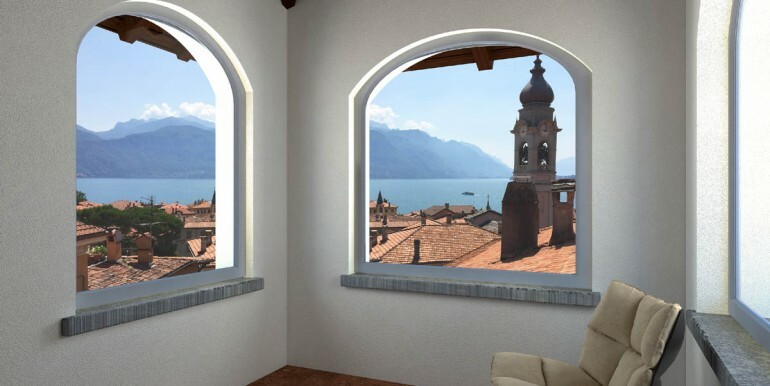 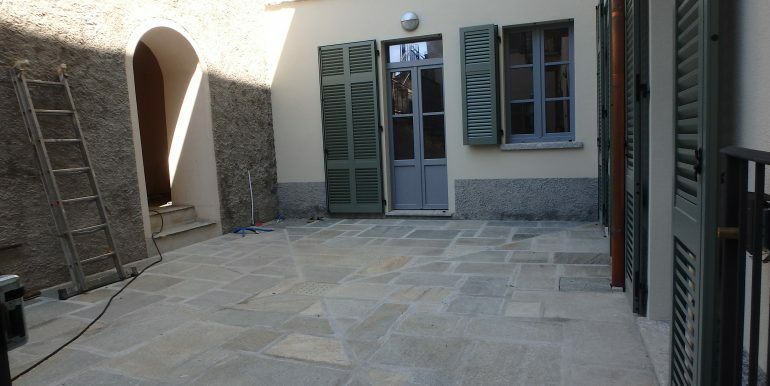 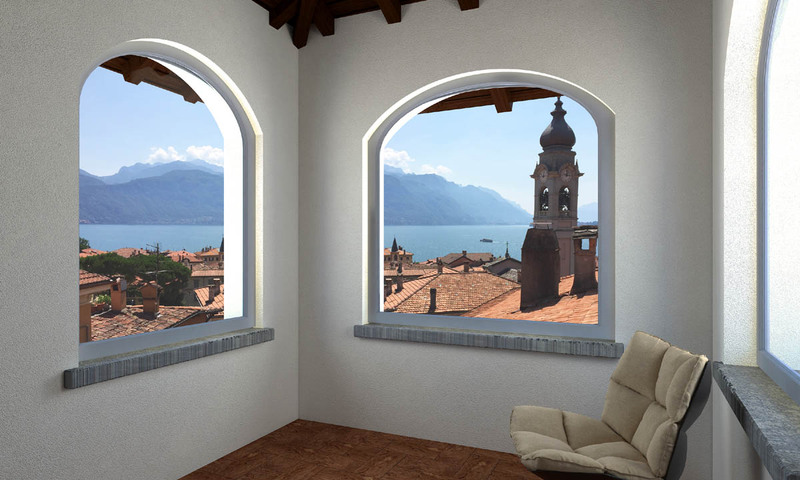 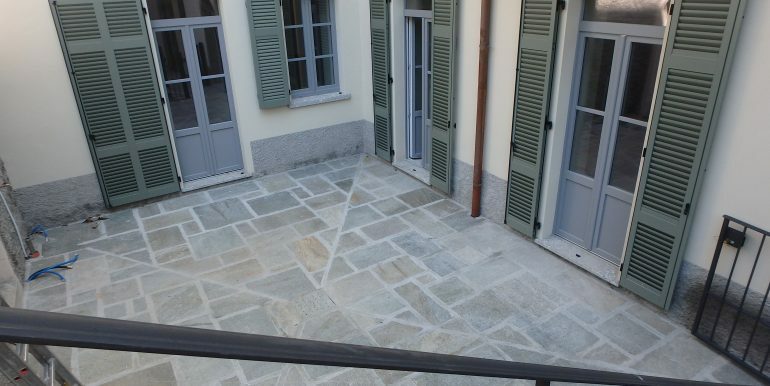 In the characteristic historical centre of Menaggio, there are these brand new stylish apartments result of a complete renovation of the important period villa “Castelli” that is currently taking place. 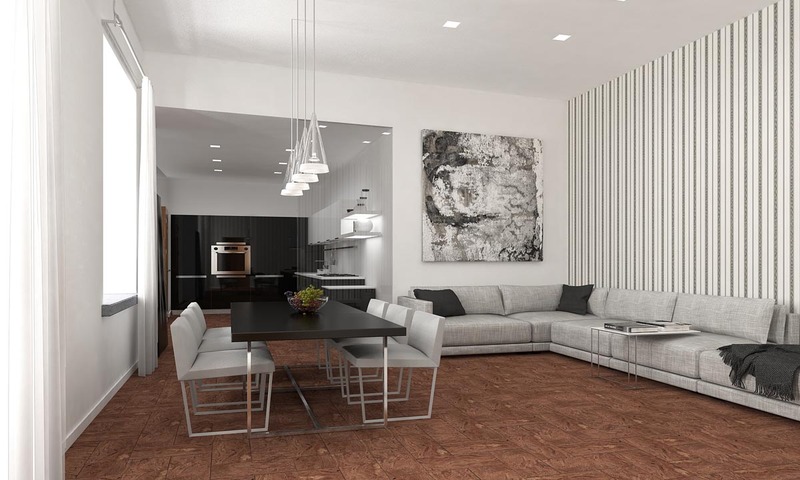 Modern design and high quality finishes blend with original period features like frescoes, vaulted ceilings and coffered ceilings creating a unique and elegant mix. 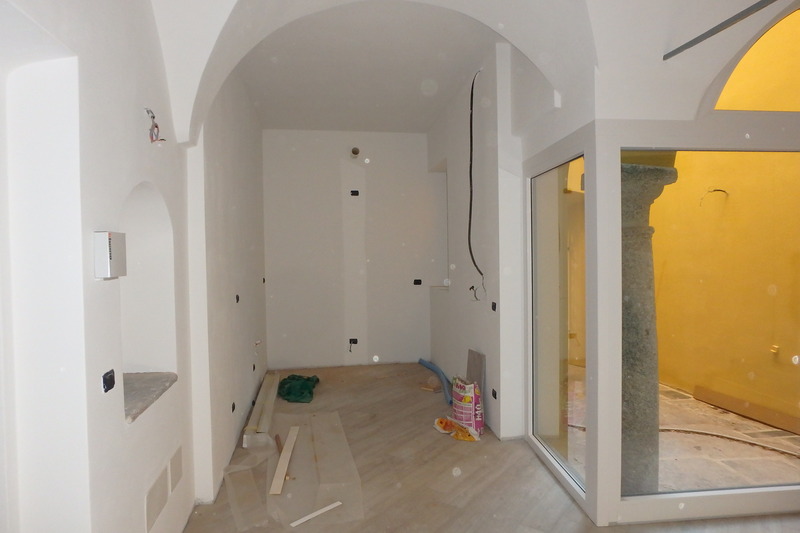 The entire villa develops on a surface of about 1.350 sqm and has a land of about 1.700 sqm. 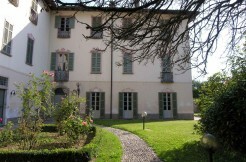 The land hosts the shared garden, the swimming pool and the parking. 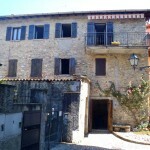 The villa is disposed over different levels that can be reach by the old staircase or by the new lift. 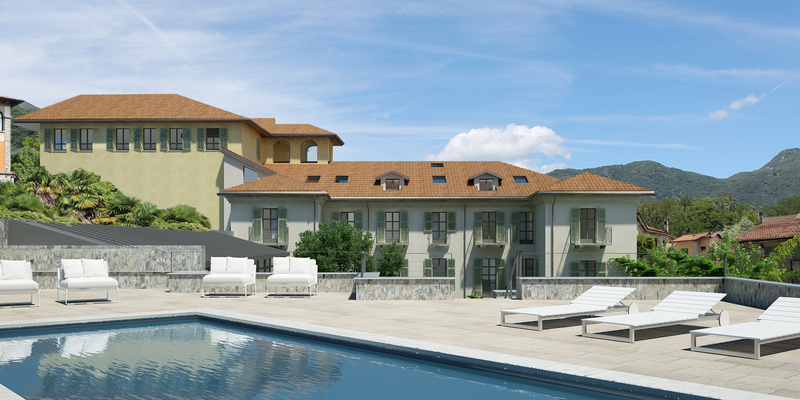 The villa is going to be divided into 11 units in total. 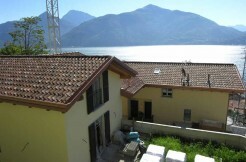 Prices from 295.000 euro. 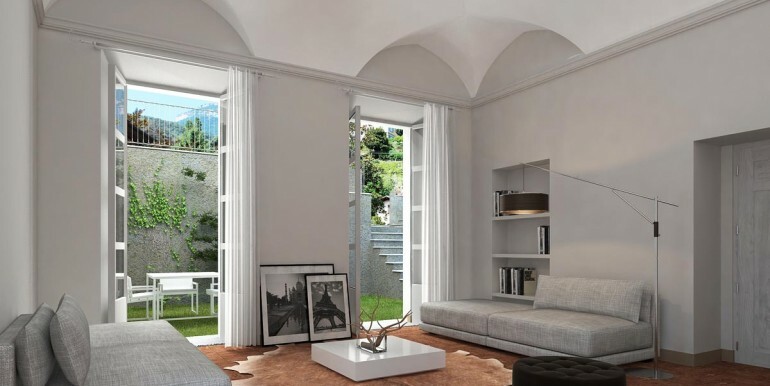 Following some examples of apartments. 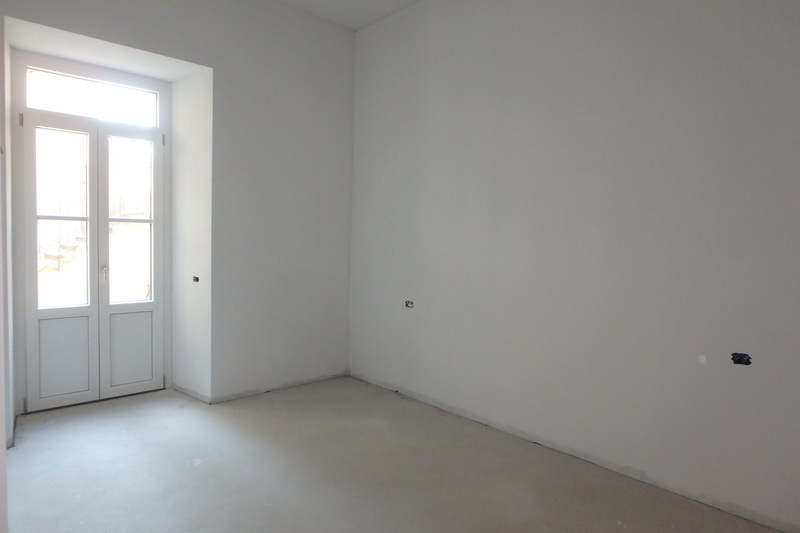 Apartment n. 2 has a total surface of about 165 smq and is disposed over 2 levels (ground floor and first floor). 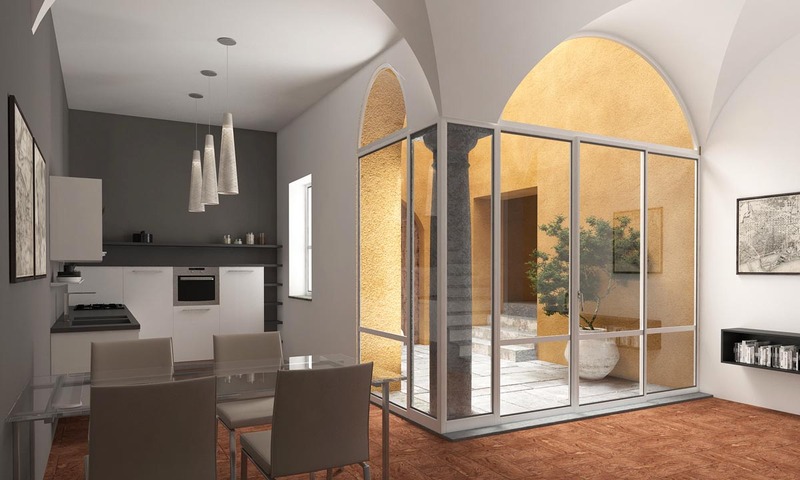 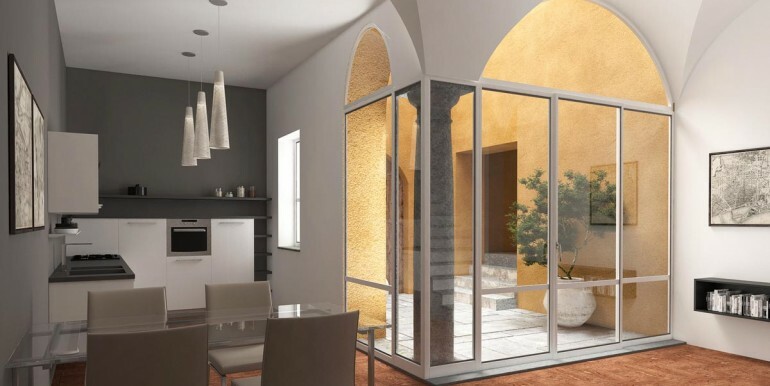 It has a living room, kitchen, 2 bedrooms, 2 bathrooms, walk-in closet, balcony, private courtyard and private garden. 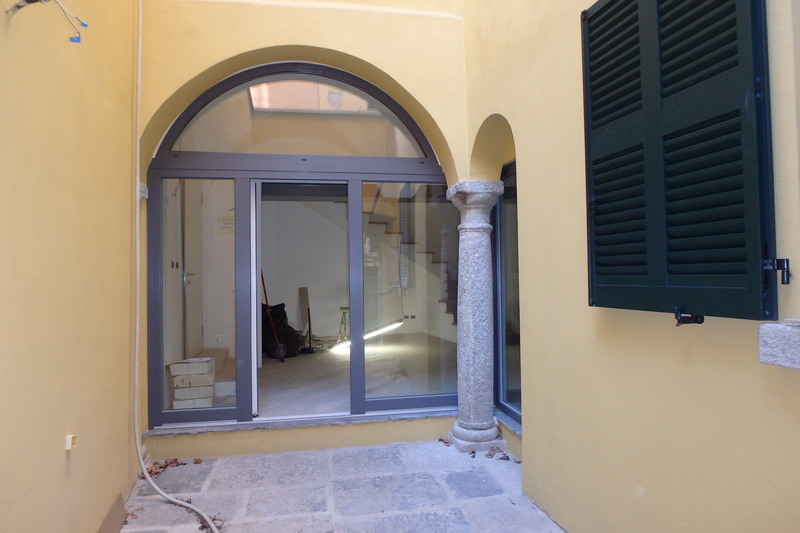 Apartment n. 5 develops over one floor (the first floor) and has a total surface of about 150 mq. 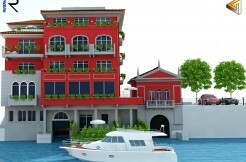 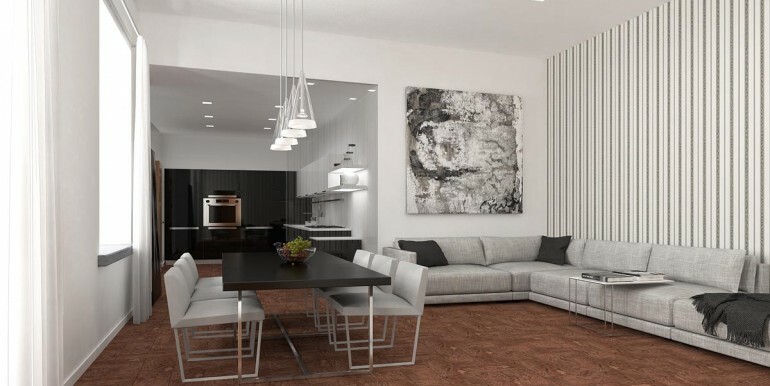 It has a large living area with dining area, a kitchen, 2 bedrooms, 2 bathroom and one balcony. 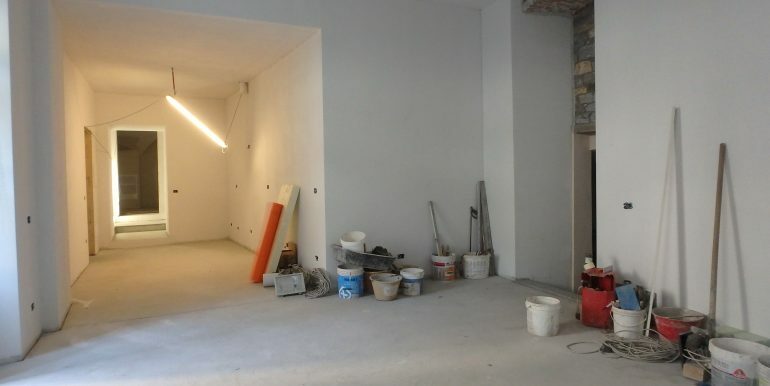 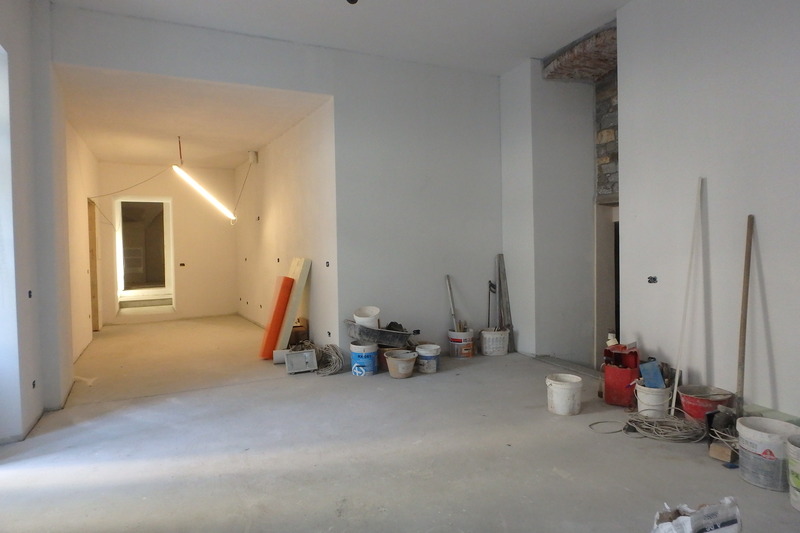 Apartment n. 7 is located on the second floor and has a surface of about 170 sqm. 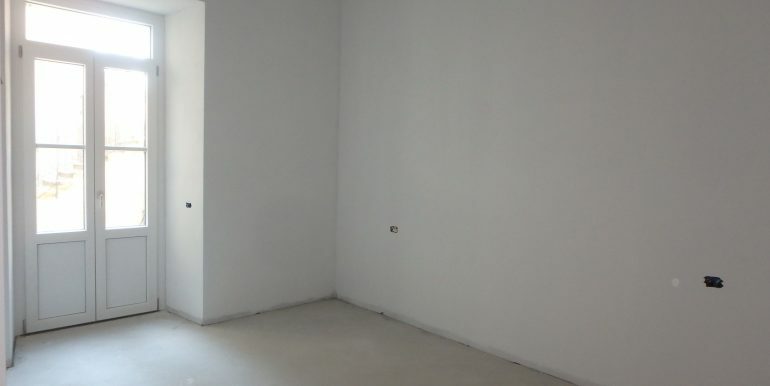 The duplex is organized as follows: wide open-space with living area, dining area and kitchen plus a bathroom on the lower level, while on the upper level there is a mezzanine that opens on the living area, 2 bedrooms, one bathroom and a study/relax area. 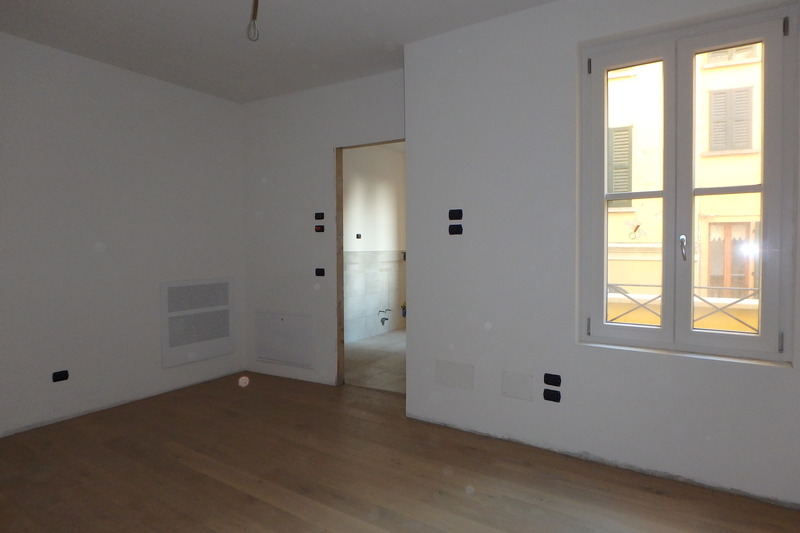 Apartment n. 8 is on the second floor and has a surface of about 130 sqm. 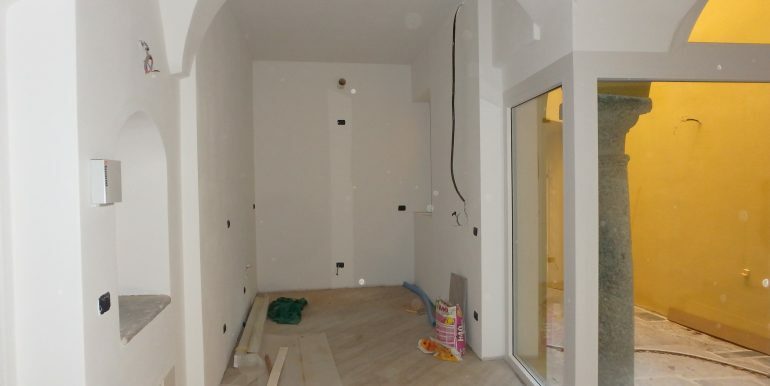 It has a living area with open kitchen, bathroom, bedroom with balcony and loft. 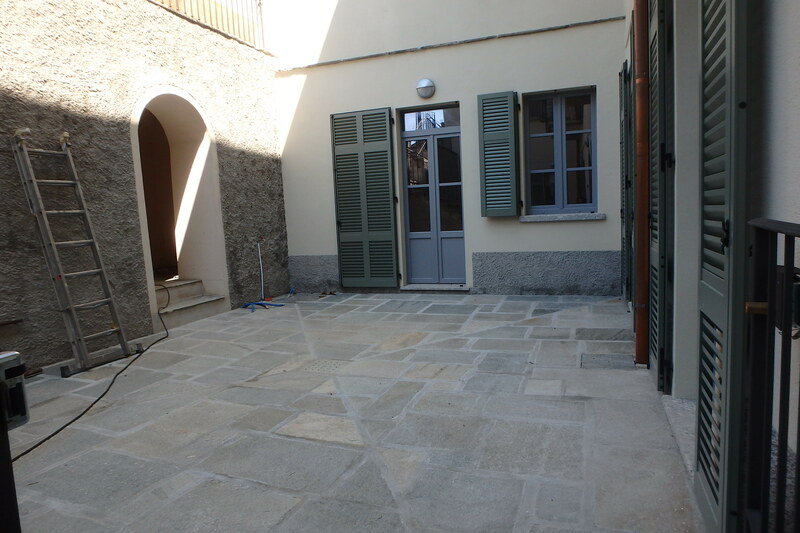 Apartment n. 9 is on the second floor and looks towards the shared garden. 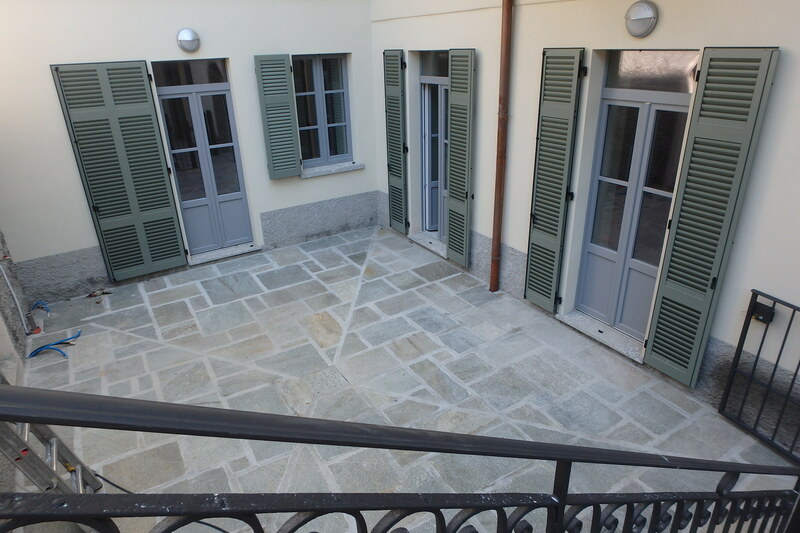 It has a surface of about 100 sqm and is organized as follows: a wide open-space with living area, kitchen and dining area, balcony, then a walk-in closet and a guest bathroom; on the upper level a mezzanine that looks on the living area, with a relaxing or study area that has also a little terrace in the roof, a bedroom and a bathroom. 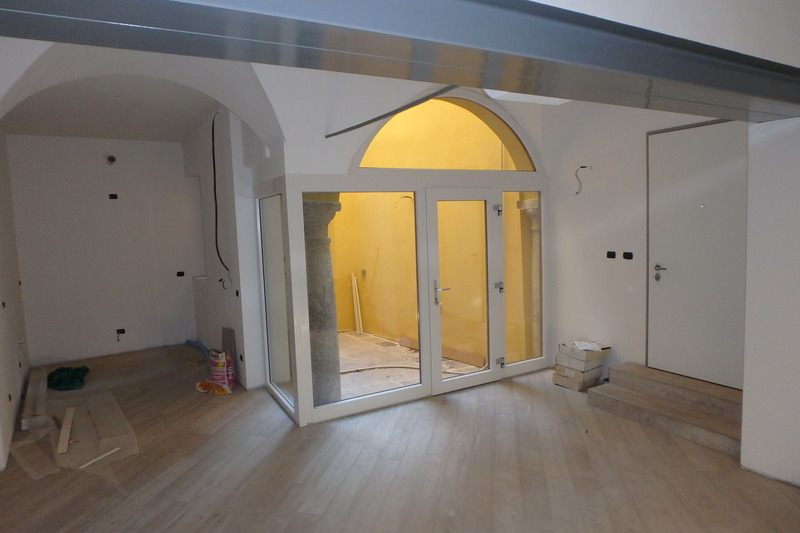 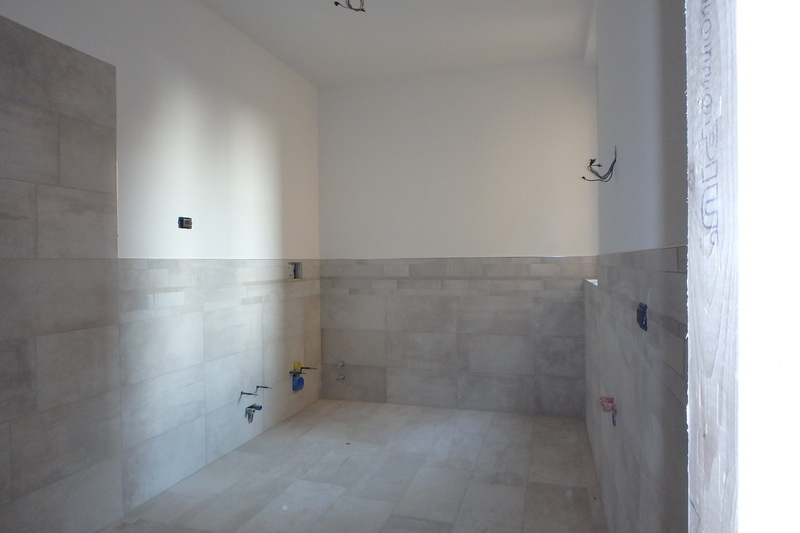 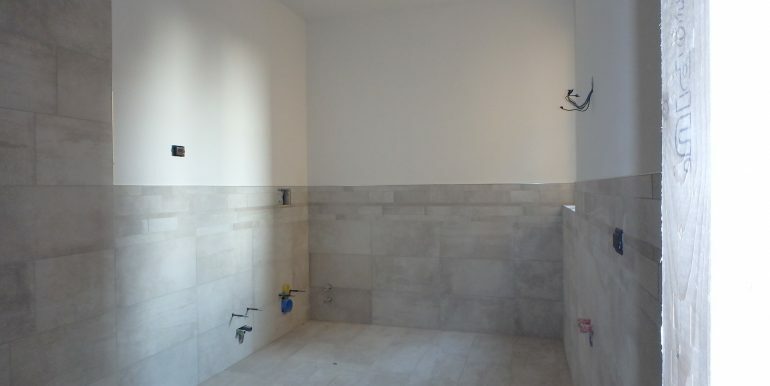 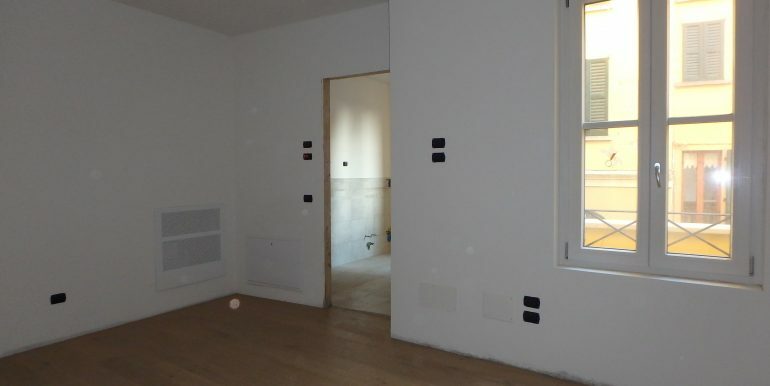 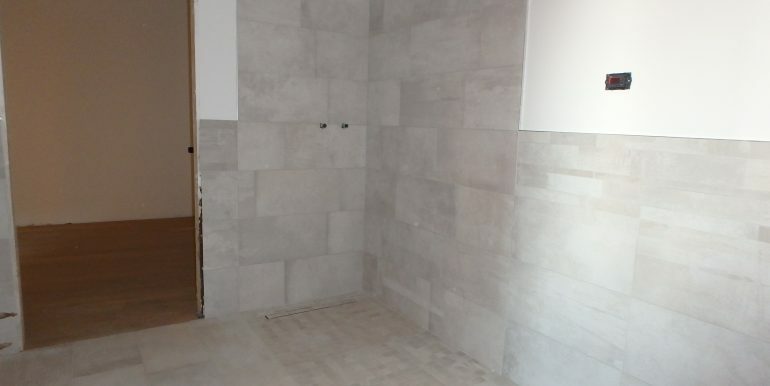 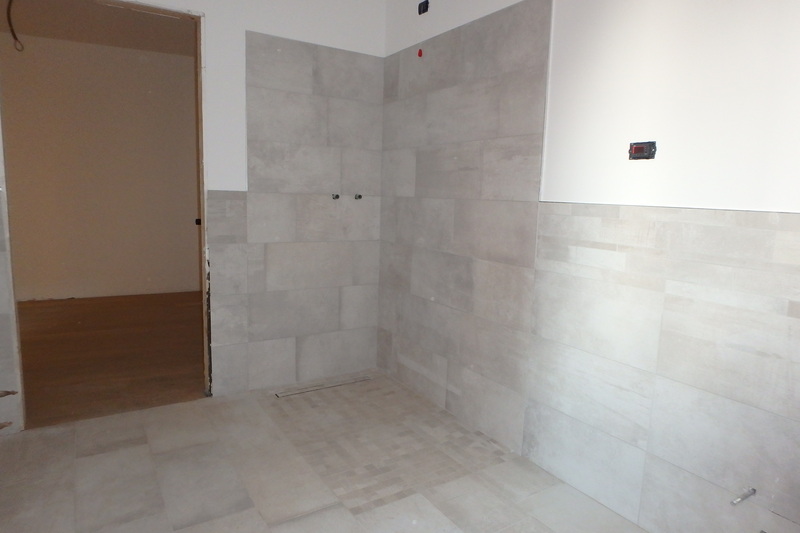 Apartment n. 10 is the biggest one and has a surface of about 200 sqm and is disposed over different levels. 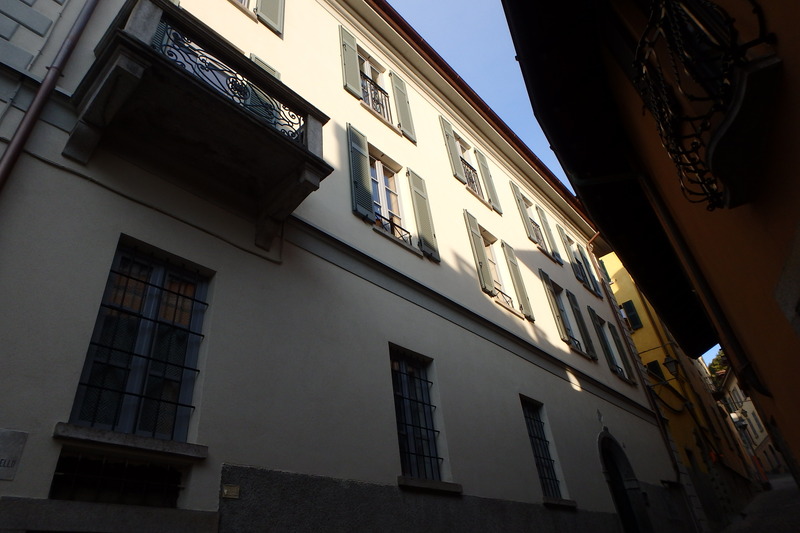 On the first level (second floor) there is a wide open-space with living area, dining area and open kitchen, a bathroom, a walk-in closet and one bedroom, 2 balconies; on the upper floor a mezzanine that looks over the living area with a relaxing or study area, one bedroom with en-suite bathroom and a little terrace in the roof. 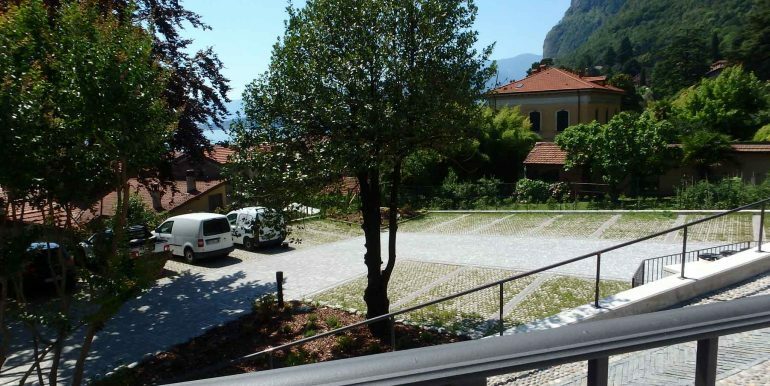 From this level, there is access to the top level that is the area that makes this apartment unique: a room with 180° view over the lake, the surrounding mountains and the roofs of Menaggio’s centre!